My first visit to Zola Bistro occurred this weekend. Fueling up before an afternoon of errands on Washtenaw Ave, Zola Bistro in the new Arbor Hills complex seemed like a perfect Saturday brunch choice. Like several of the other businesses in the Arbor Hills complex, the interior of the restaurant features many walls of large windows, making for a bright and cheery space. When we visited on Saturday morning, a bit before 11:00 AM, we scored a parking spot practically in front of the door, and were seated immediately at one of the few remaining open tables in the bustling restaurant. Getting there, parking, and being seated was certainly a much easier process than visiting Zola Bistro’s sister restaurant, Café Zola which is located in downtown Ann Arbor, at least on this particular day, I will say. As long as you’re up for braving the Washtenaw traffic, but it really wasn’t a big deal coming from our side of town. First up, coffee. Natch. Hot, strong, and supa phresh super fresh. Just my stlye. The huz could not resist ordering the special of the day and I was nearly floored when it was delivered. Look at this PLATE! 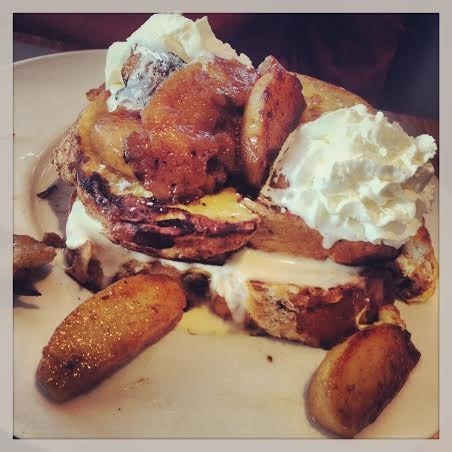 This was the special of the day – French Toast made with cinnamon raisin bread, baked cinnamon apples, a creamy mascarpone cream sauce, topped with whipped cream. It was incredibly decadent. I had a bite and, as you’d expect from its appearance, it was heavenly. Huge portion, too. This plate was piled high. I ordered a Zola staple – the Turkish Brunch. 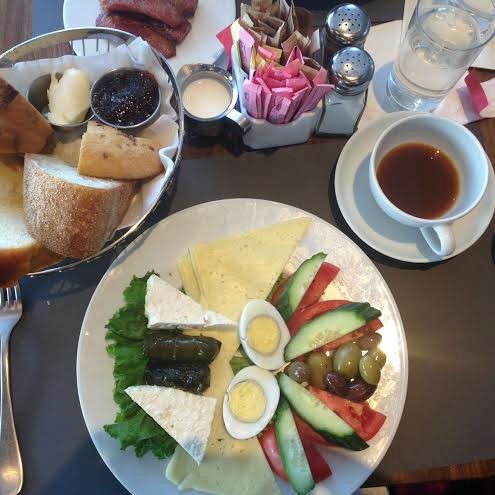 I’ve heard much about the Turkish Brunch (which is also served at Café Zola) and seen many pictures of it before, but this was my first Turkish Brunch experience! The brunch features tomato slices, cuke, olives, havarti and feta cheese, dolmas (stuffed grape leaves), hard-boiled eggs, and a basket of Zingerman’s Bakehouse bread and pastries, with fig jam and butter. Oh my! I.Just.Loved.This. The best part of this brunch was that I did not feel disgusting afterwards, like I often do after pigging out on say, pancakes and bacon. Food – Loved the food. 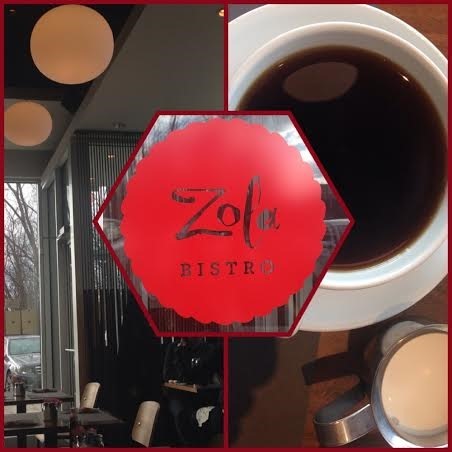 Zola Bistro excels in both decadent and rich dessert-y breakfast foods, as well as in fresh and nutritious offerings. 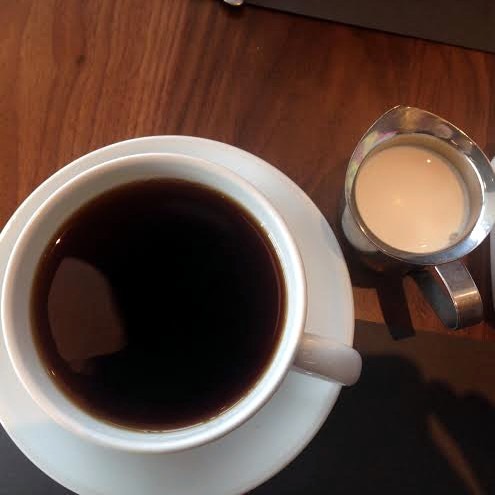 Fantastic strong coffee. Service – Friendly. Accurate. Server seemed slightly strained at times, in terms of her ability to cover all her tables. Food took quite a while to come out. 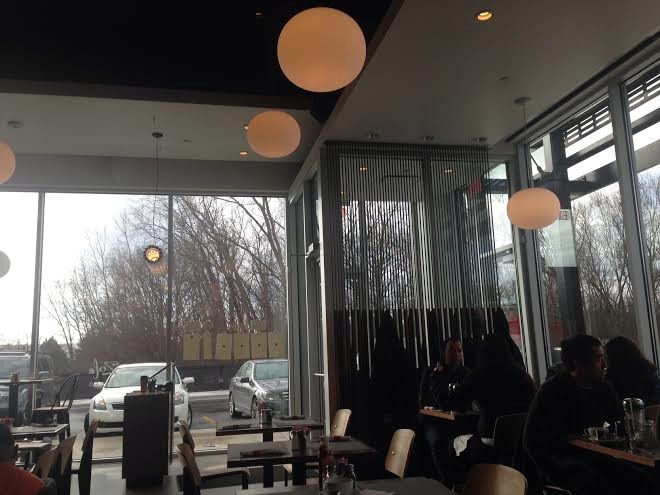 Atmosphere – Perfect for brunch. Sunny, lively buzz. Price – A bit pricy but the huge brunch portions help! Would I Return – Yup! For a special treat. I’d also like to try the small plates featured on the dinner menu, which are novel to the Zola Bistro, and not a feature of Café Zola. Brunch seems to be pretty similar between Café Zola and Zola Bistro. As many awesome places to eat as there are in Ann Arbor, I’ve always thought there’s not really a lot of brunch-typ restaurants. Glad to hear that another one popped up, even if it is just a second location of one that already existed! I keep hearing good things about this place! Will have to check it out.